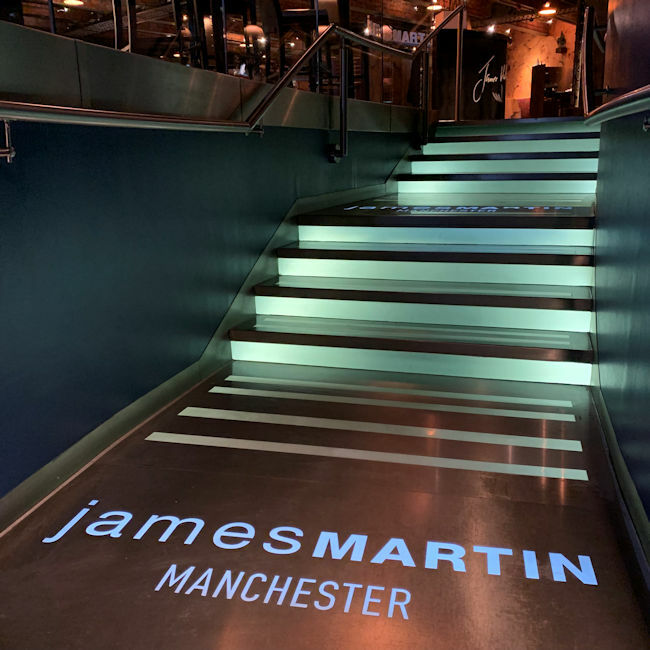 "James Martin don’t scrimp on produce quality one bit"
Despite being located in the heart of Manchester's biggest casino, James Martin does a great job of making you forget that you're, well, in the heart of Manchester's biggest casino. It feels like a bona fide restaurant, separate from the wider business, with no clatter of chips to be heard. At least not the plastic variety. The steps leading up to the dining space give a real sense of anticipation on approach, and it's broadly a smart dining space with eye-catching lighting and a truly warm feel. Other customers were having a great time and there was a real buzz about the place, even on a wet Tuesday evening. If you're there as a couple, pre-ask for a window seat if you want to feel super cozy and out of the way. In a group, ask for a booth. Inside tips! We were there as a pair, and didn’t ask for a window seat, so sat on the other side of the aisle from the window seats, en route to/from the kitchen. Pretty much every plate leaving said kitchen passed our table. It felt like we were sat in an aisle seat on a rush hour train, not in a relaxing dining space. The room feels in need of a little facelift after several solid years of wearing the same outfit. It's a good looking place, but is just starting to show its age a little bit, especially when you visit a couple of times a year as we do. Our table cloth was also a little dishevelled in places. Details. It's been a while since we've seen such stark contrasts in value at the same restaurant, on the same visit. 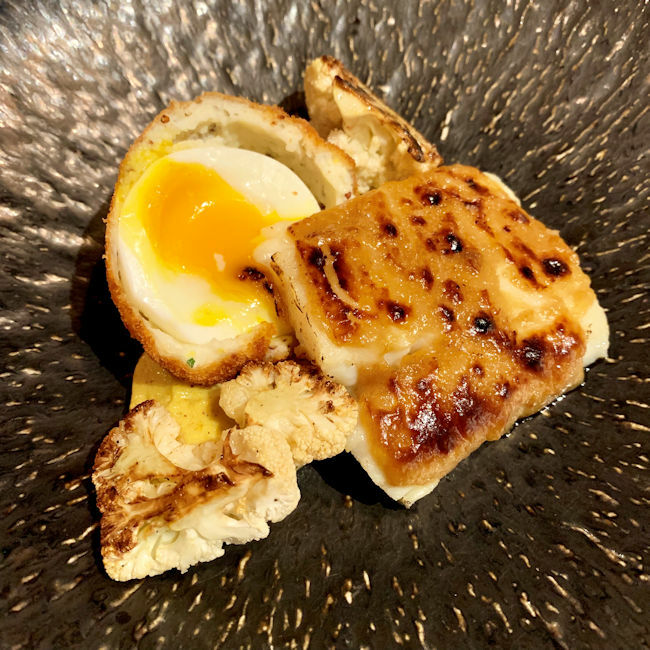 The 5 course tasting menu, plus bread, is a mere £30, which without question places it as one of the best value tasting menus anywhere in the city. 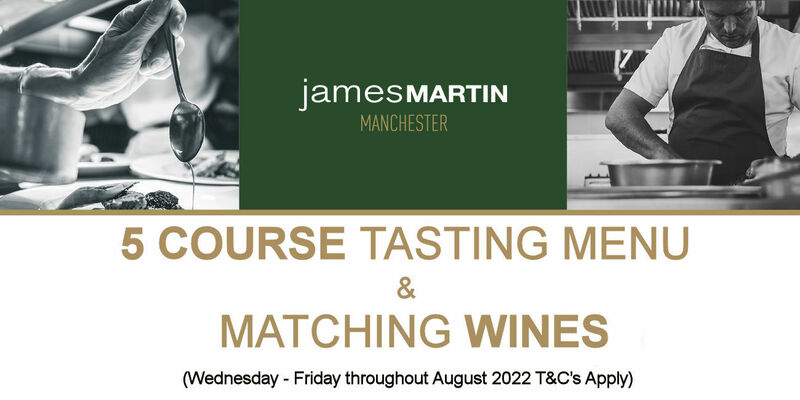 As an added perk our wine pairing which is usually £15, was free via a promotion which runs during Jan and Feb. This shifts the value for money level on the tasting menu and matched wines into the bonkers category. 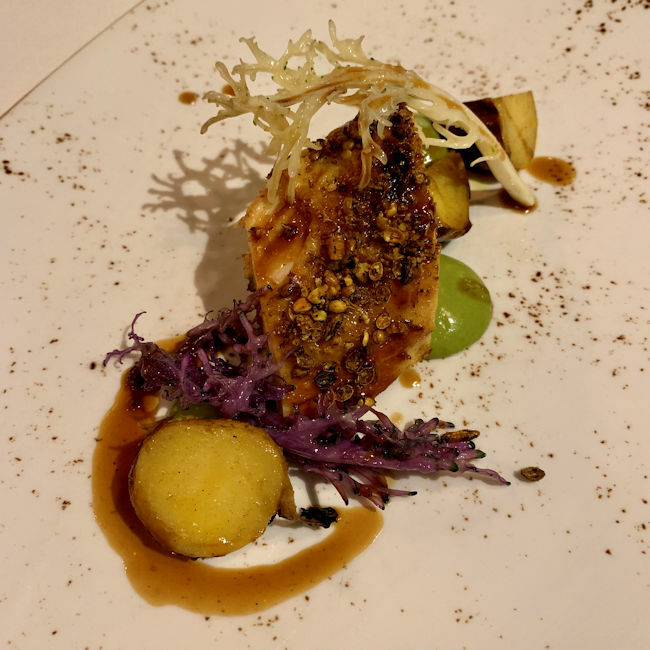 Value on the regular a la carte menu is also very decent too, considering the quality of produce being used, with 3 courses being doable for around £30. Some of the more expensive bottles on the wine list represent great value, notably the Jadot Muersault Narvaux at £85, which retails for around £50. There's an awful lot of extremely high mark ups on the wine list. The cheapest bottle available; Lobo Loco Tempranillo at £22 is a very average drop that’s available in some less than glam bars about town for 10 quid. You can get it wholesale for around a fiver, so upwards of a 400% mark-up is silly. The story is the same with many of the cheaper and mid-range options. Pick wisely. 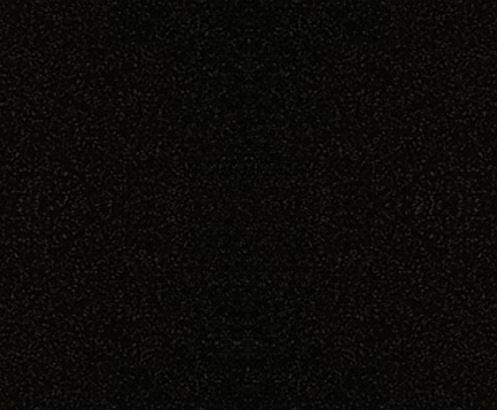 Everybody was pleasant, and said the right things more often than not. The young man who appeared to be the junior server was actually the one who did the best job of any of the 4 people who tended to us. He clearly cared, and his slight nervousness and self-doubt came across as passion and conscientiousness. I couldn’t have done his job at his age, and you can't argue with that. Whilst everybody ticked the boxes, generally, there was a massive feeling of them being on-script and forced, along with a slightly flat feel to things. Just over 2.5 hours for 5 tasting size courses felt slow. Very slow. We had to jog out of the building, which will do us some good in fairness. Our last bus back out to the sticks is at 21:15, so had it been a £40 taxi home, the evening's value for money would have taken a right battering. James Martin don’t scrimp on produce quality one bit. Yorkshire Wagyu beef is on the menu, we assume from the fantastic Warrendale Wagyu? Such delights are a sign that you're in a place which considers both region and quality. 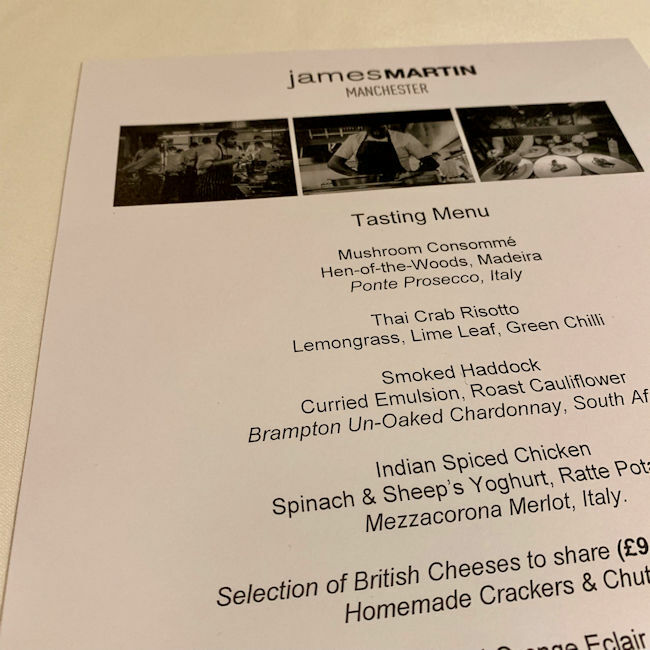 And I guess that Yorkshire produce had to feature on any JM menu. 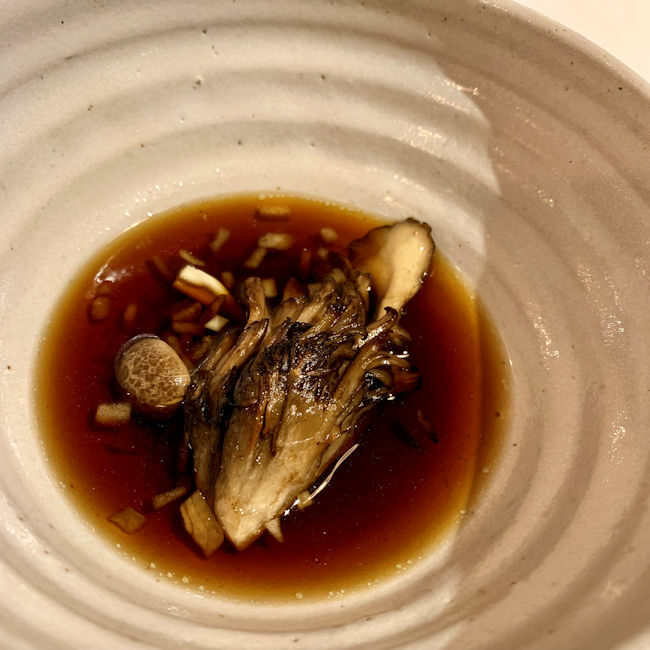 Via the tasting menu, we started with Mushroom Consommé which was finished with a meaty slice of hen of the woods. This one split the table, but I personally found great pleasure at the bottom of my stoneware bowl. Lovely earthiness and bags of umami in the broth, with an acid burst from specks of raw, super-fine-diced onion. 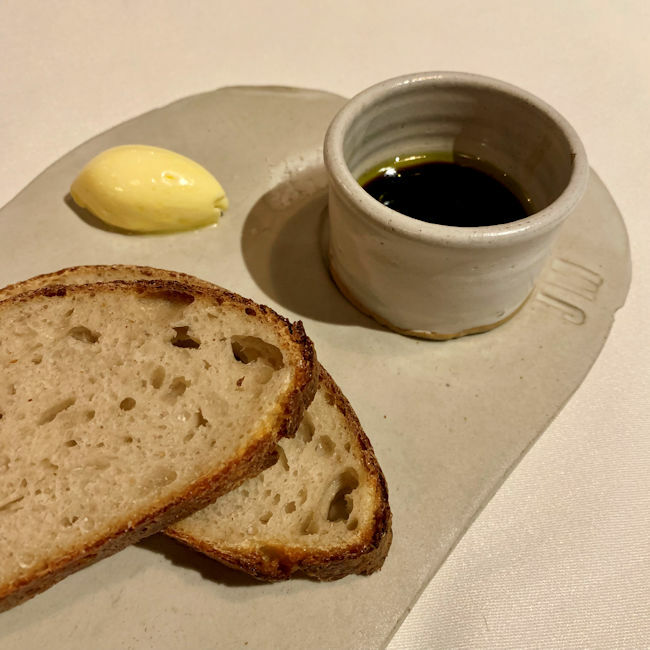 Some nice sourdough and lovely butter with balsamic/OO dip comprised the second course. 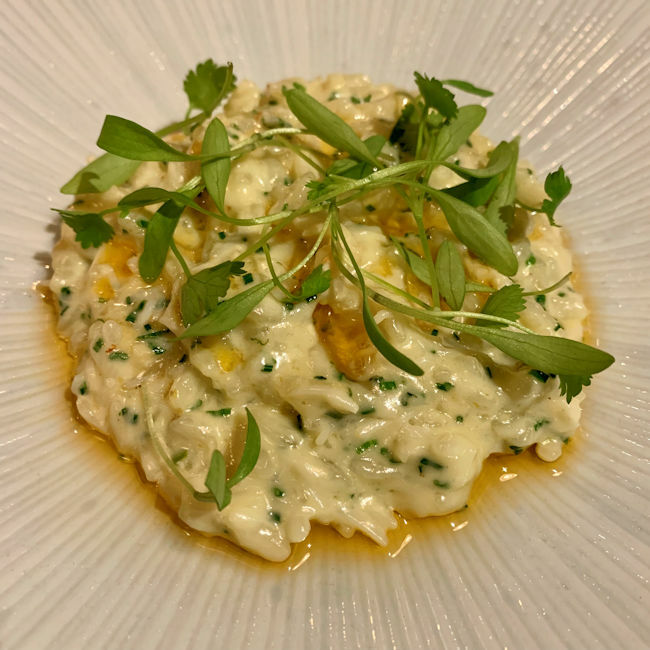 Thai Crab Risotto followed, which, as much as the Italian purist in me hates saying it; was rather splendid. Getting the flavour balance on this one would be a feat, but they did it. The course of the night, we all agreed. Smoked haddock 'rarebit' was next off the pass, and whoever said that fish doesn’t mix with cheese, was wrong. The fish was cooked like a dream and flaked away ideally. The cheese may have been a bit big in flavour for the delicate fish, but I didn’t mind that personally. Garnish was a Scotch style egg, which looked great on the plate. The whole dish was lifted by some lovely curry emulsion, or mayo, to you and I. The main course of Indian Spiced Chicken was an aromatic affair, with no heat from the spice crust, but bags of textbook Indian scent. It was dressed with a couple of potato nuggets, leaf, some spinach yoghurt, and a chicken jus based sauce. 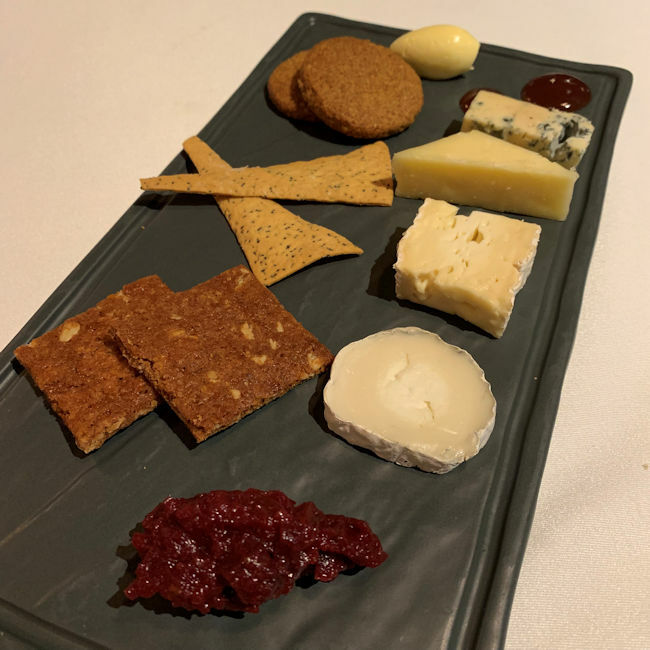 The cheese board which we ended on was again well done, in both quality and variety. A few little cooking errors, including some undercooked egg white, gone-astray crab cartilage in the risotto, flavour lacking scotch egg, some soggy chicken skin, and an under-par pudding course, all marred things somewhat, which was frustrating as the quality of cooking was broadly very decent. The latter dish, the one that you often remember the most, suffered from burnt/crispy choux pastry, filled with over-whipped cream, topped with another overdone and hence bitter after-tasting biscuit/tuile. 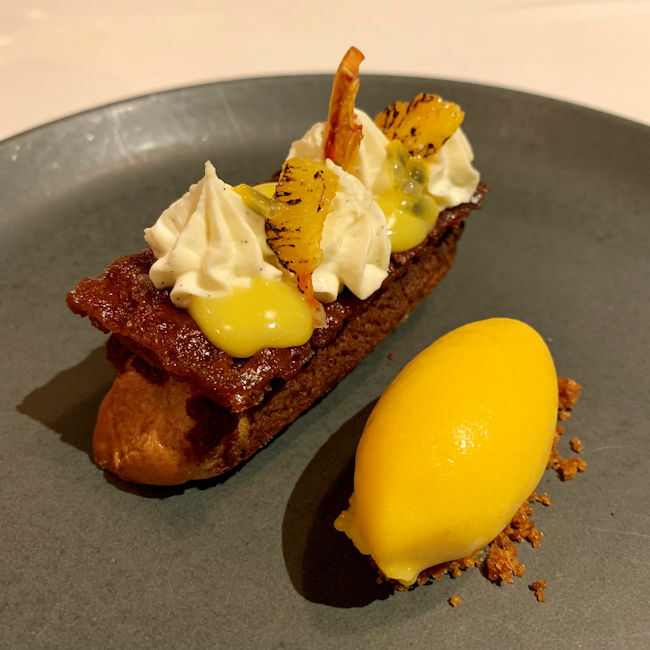 The admittedly lovely sorbet, which being acidic and tart by nature, badly needed the other components to be contrastingly sweet, rather than also bitter, to give that all important balance. There's a clear use of great produce, some solid cooking, and generally high standards across the food board, with quality and prices which ideally relate. It's got good presence, just the right level of glamour, and the dining room is still a lovely place after all these years. 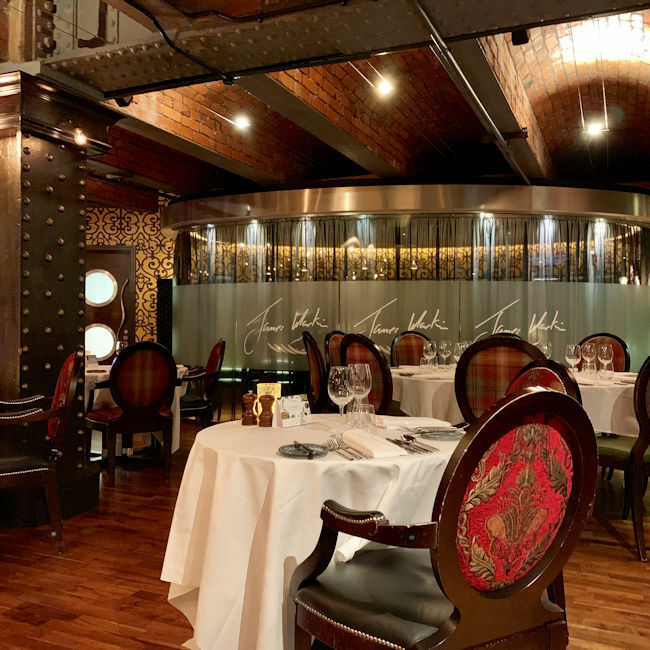 You'll be hard pressed to find a better casino restaurant, and it will appeal to the vast majority of customers' tastes and wallets. As much as it was polite and friendly, service felt scripted and was slow. A few minor food niggles, and watch those wine mark-ups on the cheaper bottles too.